MANDEM (FSU Art MFA ’15 Maize Arendsee and her partner, Moco Steinman-Arendsee) will be speaking at the next meeting of The Florida State University Museum of Fine Arts Artists’ League (FSU MoFA AL) on Tuesday, February 3, 2015 at 7:00pm. MANDEM was awarded the Artists’ League’s Professional Development Award for 2014, which helped to partially fund their attendance of the 70th annual Southeastern College Art Conference (SECAC) in Sarasota, FL. 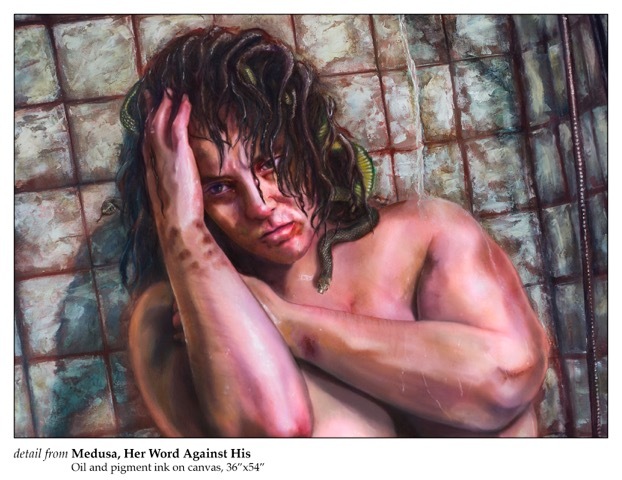 There, MANDEM showed work in the SECAC art exhibit (juried by Dr. Matthew McLendon, Curator for Modern and Contemporary Art at The Ringling Museum) and presented the academic paper “Medusa, from Ovid to Cixous to ‘Once Upon A Time’” as part of the “Wicked Women in Art” session. At the FSU MoFA Artists’ League meeting on February 3, MANDEM will be sharing the presentation made at SECAC (which traces the development of Medusa’s image in culture), and also answering questions about their art and academic research. Date/Time: Tuesday, February 3, 2015 at 7:00pm.